FAYETTEVILLE, Ark. –Six University of Arkansas Honors College students will discuss their undergraduate research in science, technology, engineering and mathematics from 10 a.m. to noon on Wednesday, Feb. 11, in the state Capitol rotunda in Little Rock. The honors students are tackling real-world research with great potential impact in Arkansas and beyond. Topics range from improving asphalt fracture testing, which could extend the life of the state’s roads and sidewalks, to finding new ways to treat diseases, including cancer, to developing shortening and chocolates enriched with a special soy oil that could cut cholesterol and boost metabolism. The students are working in close collaboration with their faculty mentors. The six U of A students will join 86 other undergraduates from 15 Arkansas colleges and universities to showcase their scientific work for elected state officials, the media and members of the general public, including Advanced Placement science students from five high schools. Ethan Lowry, from Fayetteville, is an honors biomedical engineering senior in the College of Engineering; David Zaharoff, assistant professor of bioengineering, is his faculty mentor. Lowry is part of a team that is developing a targeted delivery system for Interleukin-12 (IL-12), a protein that stimulates the body’s immune system to attack a range of cancerous tumors. Lowry’s honors thesis focuses on the development of a hydrogel derived from shrimp and crustacean shells, which can be packed with IL-12 and injected directly into a tumor. The targeted delivery is critical, since IL-12 would spark a toxic systemic response if introduced into the bloodstream. 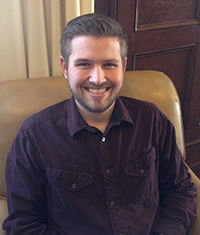 Lowry previously presented his research at the 2014 national meeting of the Biomedical Engineering Society; his work has been supported by Honors College research and travel grants. He plans to pursue graduate studies in biomedical engineering at the University of Auckland, New Zealand. 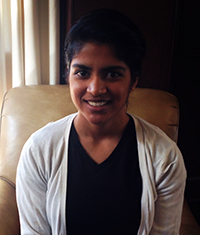 Padma Manavazhahan, from Bentonville, is an honors biochemistry senior and Bodenhamer Fellow in the J. William Fulbright College of Arts and Sciences; Paul Adams, associate professor of biochemistry, is her faculty mentor. Manavazhahan is studying proteins that regulate cell growth and could potentially contribute to research on diseases marked by abnormal cell proliferation, such as cancer and tuberous sclerosis. Her work focuses on Ras homology enriched in brain (Rheb), a regulator protein that cycles between active and inactive forms, in effect functioning as an “on/off” switch in cell growth. The protein is controlled in part by interaction with a second protein that stimulates cell growth. 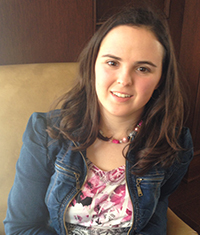 Her research is aimed at better understanding the details of this interaction. Manavazhahan previously shared her research at the 34th Annual Undergraduate Research Conference and plans to pursue a career in medicine. 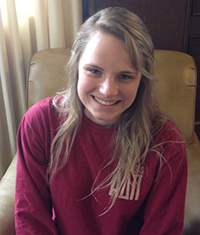 She received a State Undergraduate Research Fellowship grant. 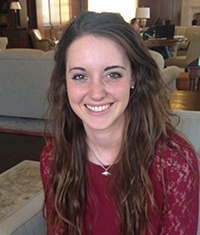 Sarah Mayfield, from San Antonio, Texas, is an honors food science senior in the Dale Bumpers College of Agricultural, Food and Life Sciences, with a second major in biochemistry. Andrew Proctor, University Professor of food science, is her faculty mentor. Mayfield is making shortening and chocolate using a new soy oil that Proctor produced that contains conjugated linoleic acid, or CLA. The CLA-enriched soy oil has anti-obesity, anti-carcinogenic, anti-diabetic, and anti-arthritic properties, and is cholesterol-free and low in saturated fat. A recent animal study by the University of Arkansas System Division of Agriculture showed that the CLA-enriched oil had demonstrated health benefits, including a 50 percent reduction in cholesterol and activation of a fat-burning gene. Last summer Mayfield traveled to Belgium, world-renowned for its chocolate, to develop CLA-enriched chocolate bars and chocolate spread in the University of Ghent’s Cacaolab. A SURF grant, an Honors College International Research Grant and funds from Bumpers College and the University of Ghent have supported her research. 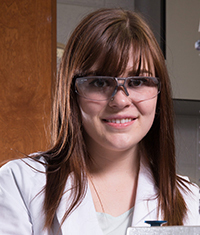 She plans to pursue a doctoral degree in food science at the U of A, then work as a chemist in the food industry. Rebekah Porter, from the Woodlands, Texas, is an honors civil engineering junior in the College of Engineering; Andrew Braham, assistant professor of civil engineering, is her faculty mentor. Porter’s research may help engineers design roads and sidewalks that last longer. She is exploring new methods to improve fracture testing of hot mix asphalt. In the traditional semicircular bend test, stress tends to concentrate at the top of a rectangular notch, which forces the crack to initiate from one predetermined place. This may not accurately represent how fracturing occurs in the field, and may lead engineers to overestimate how much force is needed to crack asphalt. Porter will test concrete arches with a circular notch, a notch with a pre-crack, and the traditional rectangular notch. She received a SURF grant and plans to pursue a career in structural engineering. Lauren Reed, from Bryant, is an honors chemical engineering junior in the College of Engineering; Jamie Hestekin, associate professor of engineering, is her faculty mentor. Reed is the sole undergraduate participating in the early stages of a project to build an artificial lung that could temporarily replace failing lungs in patients waiting for a transplant. Reed is helping to develop the materials for the lung, which consists of polysulfone hollow fiber membranes. These hollow tubes, approximately the size of a coffee straw, facilitate the exchange of carbon dioxide and oxygen through tiny pores measuring 10 nanometers in size. Reed is studying various protein coatings on the hollow fiber membranes to see which concentrations of proteins best prevent blockage of pores by proteins in the blood. Reed plans to pursue graduate studies in chemical engineering. Kaylee Smith, a senior Honors College fellow from Rogers, is pursuing dual degrees in chemical engineering and physics; Shannon Servoss, associate professor of chemical engineering, is her faculty mentor. Smith’s research focuses on synthesizing nanospheres that can be linked to molecules engineered to target diseased cells. This kind of non-systemic drug delivery system cuts down on negative side effects in the treatment of diseases such as cancer. She is using peptoids, similar in structure to the peptides that make up proteins, to form nanospheres in solution. After testing to ensure that the nanospheres are uniform in size and shape, she will test for biocompatibility and use in specific types of cells. Smith has presented her research at regional and national meetings of the American Institute of Chemical Engineers; her work has been supported by a SURF grant and two Honors College Research Grants. She plans to pursue graduate studies in chemical engineering. The event is sponsored by the University of Central Arkansas, the University of Central Arkansas Foundation, the Arkansas Science and Technology Authority, Henderson State University, and Arkansas State University.